Chilmark with the great beaches at Lucy Vincent, Menemsha and Squibnocket is highly sought after and we are offering this fine family home at a very attractive weekly rate. 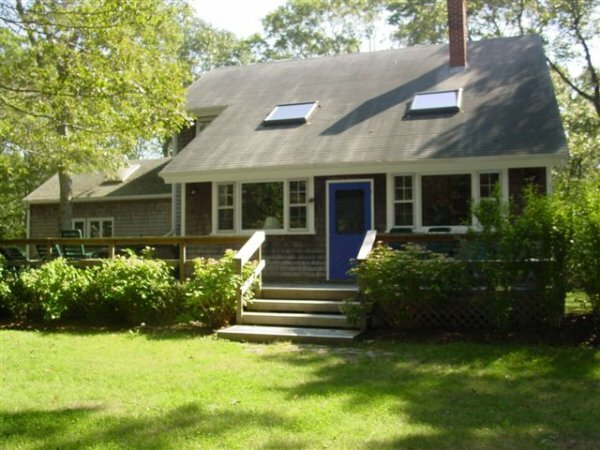 For a Chilmark rental, it is not very far from West Tisbury center and therefore offers easier access to the 3 Island Towns with fine dining, leisurely shopping, and movie theaters than most Chilmark locations. The layout is perfect for a large family or several couples to share. Downstairs is the comfy living room, spacious deck facing a beautiful landscaped area and lawn, bordered by mature trees and a feeling of privacy. On the first floor is one bedroom and a full bath. Upstairs are 3 more bedrooms and a 2nd full bath. You will love the convenience of staying just off winding, tranquil North Road, near Farmers Markets and State Road Restaurant. Not far from here you can enjoy hiking or jogging in the wonderful Waskosims Rock preserve, an exciting adventure for the whole family or for a very quiet reconnection with nature, babbling brooks and birds galore. Don't be surprised if you see deer grazing in a meadow.